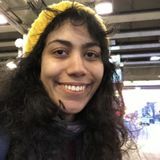 Want to connect with pegah? my name is Pegah. I am 27 years old and currently a grad student in Studio art at the school of the Art Institute of Chicago. I am really good with children and I have previous experience of working/teaching kids.little angels usually describe me as funny/goofy dino/dragon girl. so if you want your children to be surrounded by a responsible artsy kind hearted educated artist hit me up! I love reading and I love reading with kids.usually kids get along pretty well with me and they trust me. I can only work part time as I am enrolled in grad school but I can be flexible with dates. short period of time that you come up with a travel plan and you want someone to take care of the kids is the ideal for me. I am also pretty comfortable with nightshifts or few evenings in the week. talk to me about your schedule we will come up with a plan! also I love field museum and Shed Aquarium, specifically Beluga section. I have some experiences with teaching kids as well! I speak English,Farsi and a bit of French! Hello families! I am a 30 year old married mother of two who would love to connect with families and provide top-notch care!